Streams of Mercy is book three in the Song Of Blessing Series by Lauraine Snelling. Blessing North Dakota in 1905 is a small town of families who emigrated to America during the great migration period. It is reminiscent of my own ancestors who settled in nearby Minnesota, but I digress. Blessing is a hub of many nationalities that continued to make our country great. The Bjorklund family, central to the story came from Norway in 1880. Our story centers on the Anji Bjorklund Moen and Thomas Devlin. Anji, originally from Blessing, moved to Norway to live with her husband until his untimely death. Longing to come home to her very large family in Blessing, she makes a life for her children living with her sister Rebecca and her family. Thomas is an Anglican priest without a parish who meets Anji while both teach at the school. They are beginning to realize what they feel for each other as a devastating tragedy hits the town. The town pulls together in small town style to overcome a threat to all the families in Blessing. Putting their feelings aside until the crisis is over, they must choose to be with each other or go their separate ways. As with any good Christian Fiction, Streams of Mercy is filled with wisdom found in scripture and a heart full of prayer. I wish I had read the first two volumes of this series as I felt as though I missed something. The book is full of a lot of characters who seemed to me had their story told in previous volumes. It is helpful that there is a Bjorklund family tree at the beginning of the book to help me keep track. The story is wonderful and the people are so resilient, a testament to the courage it took to come across the ocean and settle into this wonderful country. Tame That To Do List! Fall seems like the best time of year to think of making changes. Resolutions on January just don't cut it for me. Fall is when I start planning the holiday season. I do a little bit of Halloween, a lot of Thanksgiving and then Christmas comes full steam ahead. That brings on more projects than I can possibly complete. I have big ideas all around and not enough time to finish them all. I have a real issue with procrastination. Bingo, I admitted it and I am so glad that I am not alone. I love reading Glynnis Whitwer's books because I can truly identify with her style. I found Taming the To-Do List to be so helpful because it breaks things down to manageable steps. Small steps that I can keep in the forefront of my busy head. At the beginning of the book you will find a question asking you what you want to accomplish. At the beginning of each chapter she checks in with you about that goal again, and that kept it on my mind. It gave me resolve to really stay focused on the moment. It also helped me get something done other than catch up with my Facebook friends first thing in the morning. I have a long ways to go yet but having some strategies I can use in the real world is a plus for me. Realizing I don't have to do it all in one setting is the bonus I recommend this for anyone who would like to give themselves the gift of doing your best everyday on your own terms. 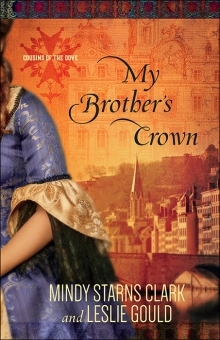 My Brother's Crown by Mindy Starns Clark and Leslie Gould is a trip back to 1685 France. Young Catherine Gillet is determined to stand up for her Huguenot faith in a time of persecution. I found this story compelling in that I did not know much about the Huguenots or their fight for religious freedom. This is a theme we read about down through the ages. This era in particular seems to have been a time when there is so much documentation of families fleeing their homes for the right to practice their faith. Our country was founded on those who made dangerous pilgrimages across the ocean to create new lives. In Catherine's case, the story of her family's flight to freedom was shrouded in secrecy that caused her to doubt her brother Jules. She learns that she cannot be sure who to trust but knows that she will not renounce her faith for safety. She keeps one eye over her shoulder for safety and her feet on the ground to keep herself grounded. The story is an inspiring tale of love and adventure, trust and above all, a faith that can conquer even the most insurmountable odds. Recently I received a copy of The Imposter by Suzanne Woods Fisher from Revell to review. I was eager to begin as the story is set in Stoney Ridge Pennsylvania as are so many of Suzanne's books. The Imposter is the first in her new series, The Bishop's Family. As I began to think of the story I wondered who the imposter might be. Would it be just one person and would I guess it right off the bat as an easy mystery? No, not so quick. The book is a good study in human nature and the reader will be surprised to learn about the characters in the story and perhaps a little bit about themselves. Katrina Stoltzfus had not been happy since her family moved to Stoney Ridge. She was in love with John who came into her life after her recuperation from the terrible accident that killed her mother. Encouraged by Bishop Elmo Beiler to come preach at Stoney Ridge, her father David pulled up stakes in Ohio and moved the family there for a fresh start. Our story begins after Katrina's recent breakup with John, the boyfriend she unwillingly left in Ohio. she is despondent, not feeling well and just not bouncing back like she should be. Bishop Elmo has died suddenly leaving his wife Thelma who is on the brink of recreating her livelihood by growing commercial moss. Katrina agrees to help Thelma, thus forging a strong relationship between the two that will last a lifetime. When Katrina goes to Thelma's she meets Andy Miller, the handsome new handyman. He seems to know a lot about the moss business but appears nearly every time Katrina turns around and is full of admiration for her. His interest in her is flattering but she can't let herself trust these feelings; not after John so recently broke her heart. Besides, nobody knows anything about Andy and she is not sure whether he is who he wants everyone to believe he says he is. Katrina is a powerful part of this story of forgiveness and resilience. However, she is not alone in her struggles. Her father is facing many challenges as the church, under Bishop Glick is about to make some sweeping changes. Many families are leaving the area for newer Amish communities in Montana where land is more plentiful and the prices are much lower. He is also under fire for some of his teachings to the young members in his baptism classes. Can he survive the stresses of the changes, some of which counter his Amish faith or will he able to find strength necessary to wait out these storms. I recommend this book not only as a good example of Amish fiction but as the first in a promising new series. Sometimes we find lessons in the most unlikely places from people we don't expect to teach us a thing. With characters like Hank Lapp and Birdy Glick in a story you just never know what you might find. Reading this book was like visiting old friends and for this I thank Suzanne for writing her many books and Revell for publishing this and so many good books.